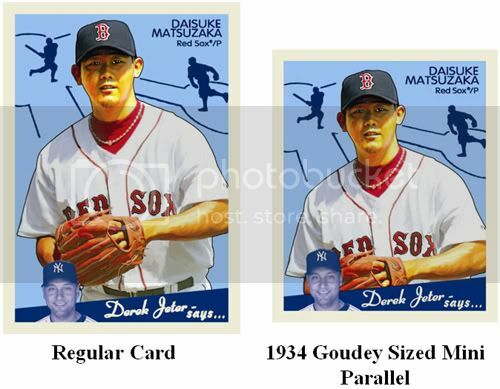 Now it's time for Upper Deck's answer to Topps' Allen & Ginter. I love retro sets, especially when they emulate their inspiration. 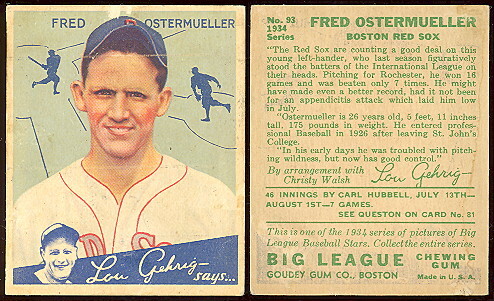 Upper Deck didn't stray too far from the 1934 Goudey design (correct me if I'm wrong) which was the model for the '08 set. ... I'll just rip it and write it. Obviously the Buehrle relic was the pull of the day, especially keeping in consideration the fact that these were retail packs. All-in-all, not too shabby, though I was expecting to see a larger variety of cards outside of the base set. A "Sports Royalty" or even a Yankee Stadium Legacy insert would have been kind of nice. I'm a big fan of the "throwback" cards like Catfish Hunter, Joe Morgan and Carlton Fisk, however. I'm not sure if you'll see any box breaks of this '08 Goudey here at Wax Breaker, but I'll definitely purchase some more packs, both hobby and retail. I'll have a hobby pack break to come later in the week, so be sure to check back in for that. Thank you! :) I'm still working on a worthy package to send. What vexes me is as a Jeter collector, am I supposed to be collecting each AL card in the set? And the Griffey Jr, for that matter? Oy vey.